In a surprise move, Marathon Pharmaceuticals told patient advocates this week that it would “pause” the launch of its drug Emflaza because of pricing concerns expressed by patients and advocacy groups. The drugmaker had announced an $89,000 annual price tag for its newly approved drug last week but patients and lawmakers immediately cried foul. “What you’re doing is robbing my insurance company,” said Dana Edwards, a mother from New Jersey whose 12-year-old has taken deflazacort, the generic version of the drug, since he was five years old. 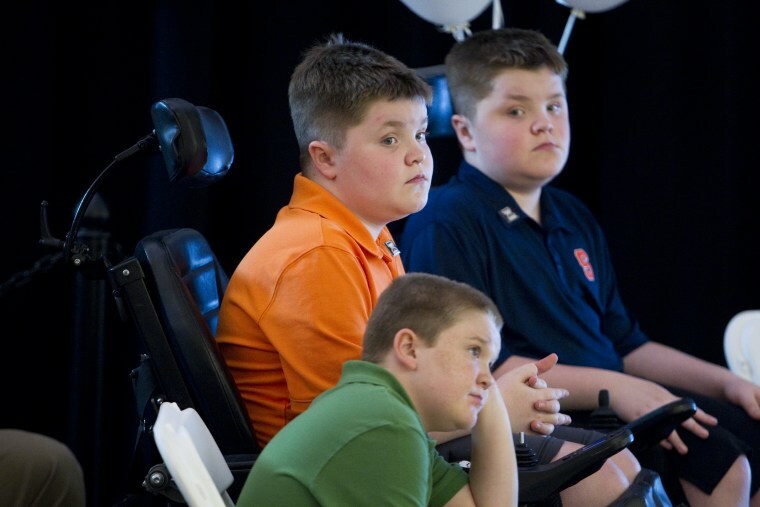 Newly approved Emflaza treats Duchenne muscular dystrophy, a rare, devastating neuromuscular disorder. Patients have been importing the generic version of the drug from overseas for about $1,200 a year. Pat Furlong, the president and founder of Parent Project Muscular Dystrophy, which sponsored the Monday morning conference, read the statement to an outraged crowd in a conference room at the Mayflower Hotel. “What you’re doing is robbing my insurance company." The company will continue to offer patients an expanded access program, Furlong read, which allows about 800 patients to receive the drug from the company. More can join that program for free, and patients can continue importing drugs from Canada or “wherever they are getting it,” the statement said. Furlong told the audience that complaints from patients helped to prompt Marathon’s action: “Since last week’s approval, they’ve heard from all of us,” he said. “Put simply we expect patients will pay a standard copay of typically $20 or less per prescription,” the statement reads. The company also heard from Capitol Hill. On Monday morning, Sen. Bernie Sanders, I-Vt., and Rep. Elijah Cummings, D-Md., sent a letter to Marathon demanding answers about the $89,000 price tag for a drug that has been routinely used by Duchenne patients since at least 2005. “We believe Marathon is abusing our nation’s ‘orphan drug’ program, which grants companies seven years of market exclusivity to encourage research into new treatments for rare diseases — not to provide companies like Marathon with lucrative market exclusivity rights for drugs that have been available for decades,” Sanders and Cummings wrote. Orphan drugs are medicines targeted at people with rare diseases, which often carry very high price tags. Emflaza was approved last Thursday for treating Duchenne disease. The drug is a steroid that manages symptoms for Duchenne’s sufferers; it does not cure the underlying disease. In January, Kaiser Health News published an investigation that found that the orphan drug program intended to help desperate patients is being manipulated by drugmakers. While the companies aren’t breaking the law, they are using the Orphan Drug Act to secure lucrative incentives and gain monopoly control of rare disease markets, the investigation found. In addition to orphan status, the FDA gave Marathon a rare pediatric disease priority review voucher, which the company can sell for millions of dollars to another drugmaker who can use it to expedite their own drug’s approval. “We believe Marathon is abusing our nation’s ‘orphan drug’ program." At Monday’s meeting, Marathon executives presented a slideshow to a packed room that detailed different patient financial assistance programs as well as the drug’s expected availability. Emflaza was expected to be on the market by mid-March, said Eric Messner, vice president of sales and marketing for Marathon. Messner explained that the drug would cost between $50,000 to $54,000 after rebates and discounts. And he emphasized that Marathon did not expect patients to pay that price. “We expect that patients will experience a low or zero out-of-pocket experience. I know there has been a lot of discussion about that. How did we arrive at the price?” Messner said. An audience member interrupted Messner asking if the company had talked to patients and families about the price. He offered assurance that they did and said there would be an ongoing dialogue with patient groups. Edwards, the New Jersey mother, said she hopes President Donald Trump will fulfill his vow to bring down high drug prices. This story was contributed by Kaiser Health News, a national health policy news service that is part of the Henry J. Kaiser Family Foundation, a nonprofit, nonpartisan health policy research and communication organization not affiliated with Kaiser Permanente. KHN’s coverage of prescription drug development, costs and pricing is supported in part by the Laura and John Arnold Foundation.